Earlier today Al Gore packaged up his Nobel Peace Prize and sent it via FedEx back to Norway. In a moment of honesty following years of lies, the former Vice-President admitted that global warming was just a clever ruse aimed to put himself back in the spotlight. Gore ascertained that the best way to accomplish this would be by creating a crisis of global scale and hence what we know today as Global warming was born. Misleading facts were floated to the public and Gore begin his much celebrated worldwide tour aimed to curb this fictions event. 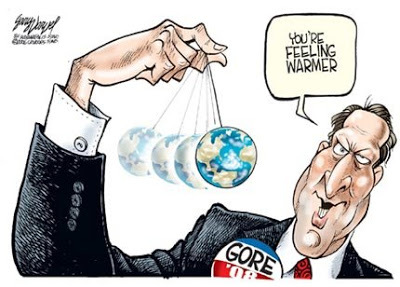 After two straight winters of some of the chilliest weather seen in decades that has lead to widespread belief that Global Warming may in fact not be real, Gore decided that he could no longer continue this farce. “It doesn’t take a genius to feel the weather outside and realize that Global Warming isn’t happening,” he said. Now that the shackles are off, Gore has promised to tackle a much more real and potentially deadly threat, Global Freezing.